Supply chain security is key to ensure that the risk of theft, fraud and corruption is mitigated in an organization. A supply chain security audit can identify existing vulnerabilities and the potential for increased risk exposure in the event of supply chain disruption. Industry experts estimate that more than 90% of global organizations are not prepared for a supply chain disruption. Knowing how vulnerable your organization is to a supply chain disruption starts with a security and compliance assessment. ShadowTrack 24/7 services include a rigorous audit of potential weak points at the warehouse level, throughout distribution and the transportation process. Physical security as well as logistics security is assessed in the audit, performed by tenured security professionals, who also provide guidance on how to address any identified vulnerability. Our team of auditors have performed hundreds of supply chain security assessments for manufacturers and distributors of high-value goods with international supply chains. Shadowtrack 24/7’s supply chain auditing services deliver insights, support and solutions aimed at helping organizations address evolving challenges of the global marketplace. As an independent service provider, we provide holistic and objective assessments of a customer’s facilities, processes, and systems utilizing industry and manufacturer guidelines along with best practices. Our technical capabilities and industry expertise allow us to pinpoint inconsistencies, weaknesses and risks as well as strengths and opportunities to better manage processes, supply chain relationships, brand reputations and regulatory requirements. Audits can be performed to standards required by a client, such as TAPA, CT-PAT, ISO as well as others. By providing comprehensive audit reports, customers are able to gain immediate and actionable insights that inform critical business decisions and strengthen long-term outcomes. 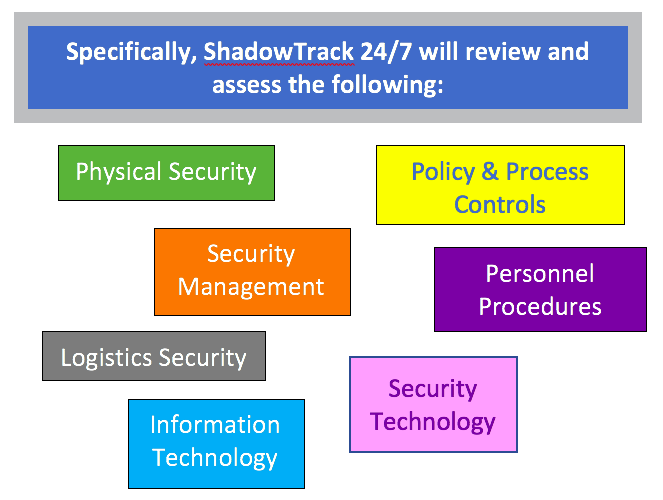 ShadowTrack 24/7 provides Supply Chain Security & Compliance Assessments Services by deploying security experts to audit all aspects of the supply chain.